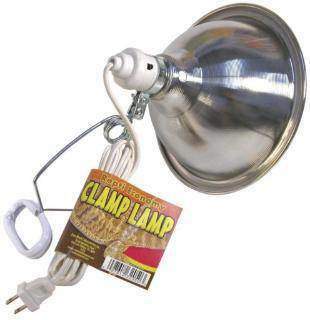 This inexpensive lamp or heating element fixture has an 8 1/2″ (22cm) aluminum reflector and six foot power cord. It is great for use with UV lights as well as heating lamps and incandescent bulbs up to 100 watts. When you are looking to light up your new pet baby tortoise or baby turtle, this is an inexpensive way to get started and can clamp to any tortoise tub, tortoise table, or turtle terrarium side or lid.